These cards are for Linda Hansen's 'An Evening To Remember' event Friday night during convention. I'm so excited to see what this is all about...she has been working on it for months. They are swapping in groups of 50, so I will turn these 50 in and have 50 new cards to enjoy when I'm done that night!! Super cute...just bought some cork...and can't wait to try it out...thanks for the inspiration! Too cute! I'm sure everyone will love them. Can't wait to see what you get back. OMGosh! These are too cute for words! I'll bet the ladies that received these were BEYOND thrilled! 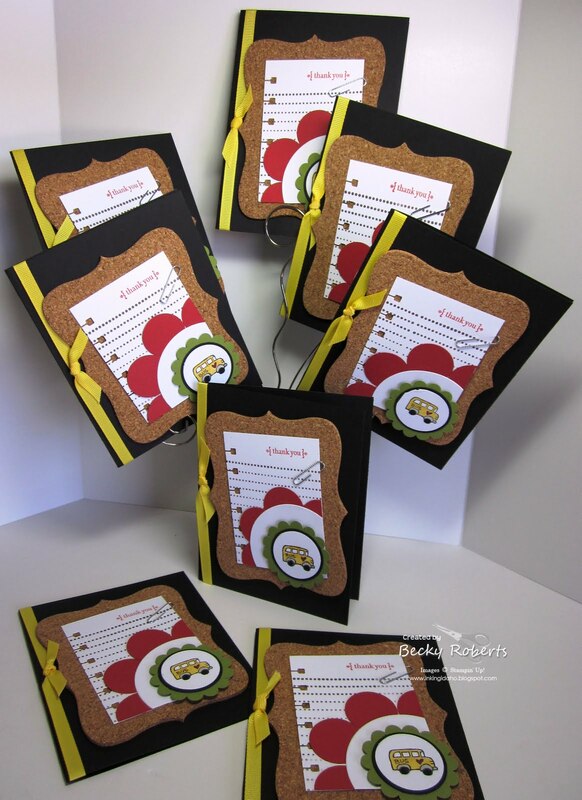 These are aorable cards! I will have to try something with cork! So cute, Becky! I've never been to convention, so I have a question for you. How many swaps total do you usually bring with you when you go? I think the biggest swap I've participated in has been for about 10 - can't imagine doing 50 like you did here! WOW! You ooze with talent girl. Everyone will go gaga over these. Becky these are very cute as usual. CUTECUTECUTE! 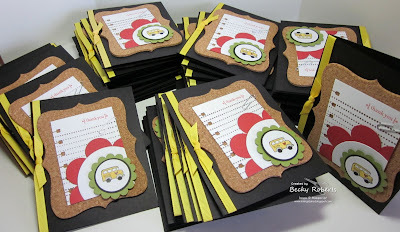 Love what you did with the little bus stamp. I got that one too and wondered how can I turn this itty bitty stamp into a cool card. BECKY to the rescue!! Love everything on this card! You're One Of The Good Ones! Two Million Hits! Thank you!